Calling All Volunteers – 350th Anniversary Needs You! 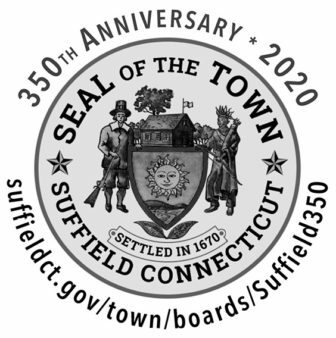 The town of Suffield will celebrate its 350th Anniversary on Monday, October 12, 2020, and people have lots of ideas for making it an amazing anniversary year! The challenge is that at this point they are ideas, and not actual plans. Creative and enthusiastic volunteers are needed to make them a reality. We need people to work on the “Big Weekend” events; the barn dance, the parade, the sporting events, the carnival, the fireworks, the gala, the town picnic, the musical and dance performances, the concert, and the commemoration exercises. In addition to the weekend of October 9-12, 2020, there are a dozens of great projects we want to complete and interesting programs we want to offer throughout 2020. Last, but not least, we need people to serve on the communications, events, finance, fundraising, and outreach committees. If you are interested in being part of the team that is putting on our big 2020 celebration, please come to a volunteer orientation meeting at the Suffield Senior Center. They are scheduled for 7 p.m. on July 10, 11, 12, and 19 and also at 3 p.m. on July 11. Send an email to Suffield350@SuffieldTownHall.com with any questions, or call Kacy at 860-668-5250. It may seem like October 2020 is a long time away, but it will be here before we know it. Getting a great team in place soon will make the celebration something to remember for the next 50 years. Saturday, October 13, 2018 will be the first annual golf fundraiser to support Suffield’s 350th Anniversary Celebration. The event will be at the Suffield Country Club.